Quiksilver just announced that its recycling program — in collaboration with REPREVE® — has just hit the 100 million-bottle mark. Since its start in 2012, about 3500 tons of plastic has been repurposed into boardshorts, jackets and other garments. Recycled polyester both gives a second life to used plastic and reduces the global footprint of a product significantly. Arguably the most environmentally impactful step of a production cycle is the creation of the raw material. Producing recycled polyester consumes significantly lower amounts of energy (45%) and water (20%) than virgin polyester. Overall, the recycled fabric produces a third less greenhouse gases than conventional polyester one. The 100 million bottles recycled through the Quiksilver x REPREVE® program save close to 9 million litres of drinking water and provide the annual energy consumption of close to 1000 households. Each Quiksilver x REPREVE® boardshort contains about 10 recylced bottles. Made from fossil fuels, plastic is a raw material that we encounter everyday. Only 10% of all plastic produced worldwide is currently recycled — the rest ends up in a landfill or worse, the ocean. Today, large amounts of plastic floating in the ocean are threatening both marine life and the global climate. “We are very excited to contribute a part to the protection of something we genuinely care about — the ocean. As surfers and snowboarders we need to think about the future, so our grandchildren can enjoy the mountain and the wave we love so much. Up-cycling plastic waste into something that is useful for us, even today, is an important step”, says Garry Wall, Global General Manager of Quiksilver. Quiksilver and fellow Boardriders Inc. brands Roxy and DC shoes have been using REPREVE® yarn as an essential part of their product offering for more than 5 years. REPREVE® starts the process by turning used plastic bottles into plastic flake, which is then converted into REPREVE® chips. The chips are then melted, extruded and converted into yarn that carries the same performance qualities as conventional polyester. 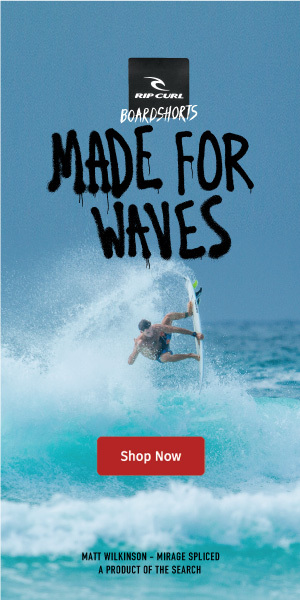 On average, a Quiksilver boardshort using REPREVE® yarn contains about 11 recycled bottles. Currently about 50% of the range consists of REPREVE® products. Over the next few years, the brand is committed to using 100% REPREVE® yarn in all boardshorts. The snow collection will follow suit, increasing the adoption of both REPREVE® yarn and other sustainable materials. On World Surfing Day (June 16th, 2018) 10$ of every Quiksilver boardshort containing Repreve fabric will be donated to 5 Gyres, a non-profit organisation empowering action against the global health crisis of plastic pollution through science, education, and adventure. ● Wash your synthetic fabrics less and hand-wash if possible. ● If you already own a washing machine, consider installing a microfiber filter. It can’t catch everything, but it can help. ● Keep your lint filter clean so that the microfiber particles that it captures end up in the trash, not the air. REPREVE fibers can also be enhanced with Unifi’s proprietary technologies for increased performance and comfort.